This pretty gown is inspired by the live-action Disney Cinderella remake. 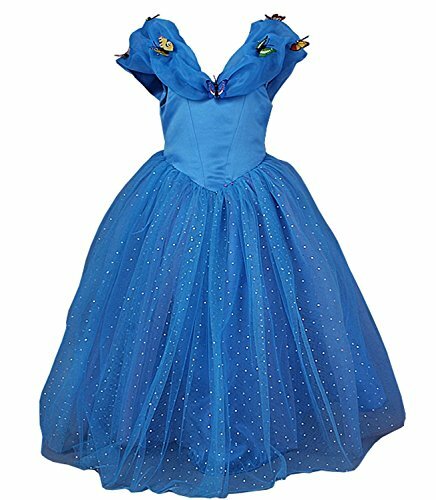 The glamorous blue dress has some great details which make it a fun costume choice for little girls this Halloween! Girls will love to dress up as Cinderella herself with this pretty deep blue gown. The highly rated iconic Disney outfit is perfect for little princesses. The skirt has a full feel with multiple layers of tulle. The gown comes with darling butterfly appliques which are shipped unattached to prevent damage to the dress or butterflies. Attach the pretty insects wherever you like! This is a fun and new-for-2015 princess costume idea for little girls this Halloween!